It's hard to say whether the low price is the best thing about this guitar or simply the cherry on top. Cool looks. Incredible price. Sturdy feel. If you've never heard of Samick, now might be a good moment to take notice. 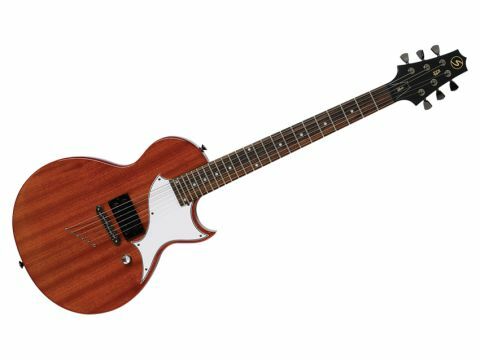 Samick is a Korean company that has made guitars for Epiphone in the past but also crafts its own models, including the retro 'JTR' brand, which is designed by the former head of Gibson's custom shop, JT Riboloff. This guitar is the most basic design in its series, but its hot humbucker and modded Les Paul Junior styling suggest it's not for the shy. So, are we dealing with another vintage clone that has cardboard tone or a fire- spitting rock 'n' roll original? "The body has dinky dimensions, but it's a righteous, 3.3kg slab of mahogany." First up, the body's dinky dimensions make it comfortable to hold, especially when you're sitting down. But don't expect featherweight handling - the LN10 is a righteous, 3.3kg slab of mahogany. The neck is no baseball bat; its full profile suggests strength and tonal authority. The classy, two-piece neckplate is neatly recessed into the body and gives a glued-in feel that suits the obvious Gibson influences of this model. In play, the action is taut but comfortable, inviting you to dig in and squeeze the juice out of every note. The finish is impeccable for the price. Nothing fancy, just a classic cherry stain and a deep, glowing coat of lacquer. It's authentic and attractive: big kudos to Samick for getting the vibe so right. The crystal on top of the volume dial is a love-it-or-hate-it styling detail; some will dig the touch of bling it adds to a workmanlike design, while others will feel it has more business dangling on the end of a bathroom light-pull. Either way, it's one of the subtle quirks that helps set this guitar apart. Good looks won't help if the tone is lame, of course. Happily, the first few strums confirm that the LN10 is no sonic lightweight. Through a 30-watt valve amp, the lone 'bucker serves up more grunt than a Wimbledon final, with a woody, jagged voice that takes you from Green Day to Black Sabbath faster than you can say "who needs a neck pickup". The strings- through-body design offers good sustain, while backing off the volume yields a surprisingly sweet, transparent clean tone. Modern metal-mongers should probably look elsewhere, though; the LN10 lacks the clinical precision to be truly effective in that role. If you love the stripped-down cool of guitars like Gibson's Les Paul Junior, but are reluctant to blow your budget on a guitar with just one pickup, this could be the answer. Although you're limited to one sound, it's a cool one, and the custom-wound humbucker responds to volume changes in a very dynamic way, making it more versatile than you might think.